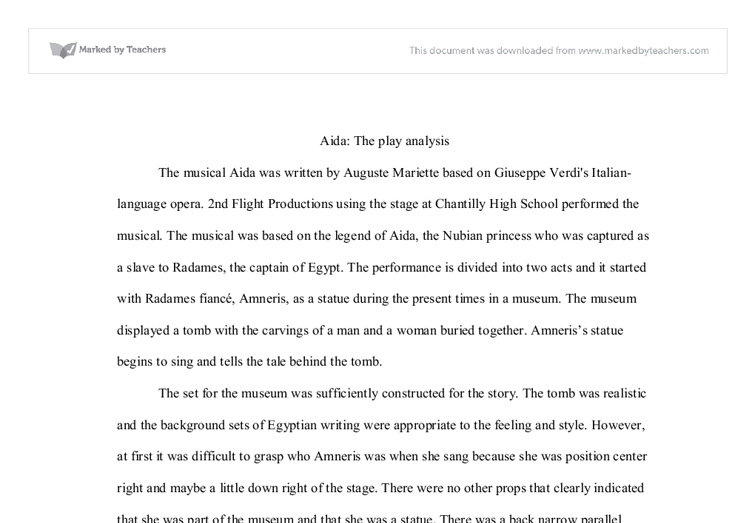 Aida: The play analysis The musical Aida was written by Auguste Mariette based on Giuseppe Verdi's Italian-language opera. 2nd Flight Productions using the stage at Chantilly High School performed the musical. The musical was based on the legend of Aida, the Nubian princess who was captured as a slave to Radames, the captain of Egypt. The performance is divided into two acts and it started with Radames fianc�, Amneris, as a statue during the present times in a museum. The museum displayed a tomb with the carvings of a man and a woman buried together. Amneris's statue begins to sing and tells the tale behind the tomb. The set for the museum was sufficiently constructed for the story. The tomb was realistic and the background sets of Egyptian writing were appropriate to the feeling and style. However, at first it was difficult to grasp who Amneris was when she sang because she was position center right and maybe a little down right of the stage. ...read more. Her body language was like a building wearing away and her facial expressions revealed pain and sorrow. Another moment that was very effective was when she finally accepted her love for Radames. Her body language was playful, her voice was light and her facial expression was soft and more youthful. She was the best and most excellent actress in the play. The lighting had its good effects and bad effects. During serious moments, the lighting was used well and isolated the light towards the main characters. However, when the music became lively, the lighting was in all different colors, similar to a disco lighting, which I found unnecessary and sloppy for a historical musical. The costuming was decent as well but I expected more from a community theatre company. The costumes would be acceptable for a high school production but not a community one. ...read more. The dances seemed a little parallel and conformed to the same movements at times. The ensemble men were Radames soldiers in the beginning and did a dance routine that had the characteristics of a march. The performance of the ensemble however, was poor. Their entire routine was not in synch and it was sloppy. In order to portray as soldiers, they should have had more cut and dry movements that were sharp and strict. However, they performed as if they were relaxed and bored. It was more of a casual walk than a march. Towards the end the soldiers did an impressive break dance when the song lifted from its austere melody, however I found it unnecessary. Overall the musical was satisfactory as a community musical. The background music was appropriate, the main actors were excellent in portraying their characters and the songs were sung on key. 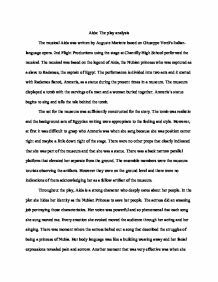 Although there were many errors in setting, and ensemble members, the director succeeded in telling and portraying the story of Aida in a reasonable fashion. ...read more. very weary of her repetitions and explains that he knows (in a very practiced tone which is how I suggest this isn't the first time they have had this conversation) that he killed his wife and son and that he didn't need to be reminded anymore of it. Mr Peachum hatches a plan to frame Macheath thus getting him caught and sentenced to death, however Polly comments that his plan will not prevail, creating a strange relief in the audience as they find themselves wanting Mac to escape. As a result, strong female Marians have appeared more recently. The children's television series, Maid Marian and her Merry Men, saw Maid Marian as the swashbuckling hero with Robin as a vain and rather camp wimp. This role reversal of Robin and Marians' character is also seen in a television advert for Weetabix. I realize now that my reaction was spontaneous as I was quite stressed as I had to very shortly go and appear for an examination, and I did apologize for my behaviour, as in my mind I still feel as I am not to blame as I had informed them about my exam. I talked about how a five year jail sentence was not enough for what I have done and that I will never forgive myself, not ever. When I performed this monologue I kept looking at the floor through most of it to show how ashamed I was. At the beginning of the movie, the audience is given reason to believe that the mafia are capable of dispatching of the corps of disrespectful rivals or disobedient/ infidel fellow members (it isn't clear, but the audience is led to deduct such possibilities). Various cameras are used to keep track of anything unexpected that happens on the set. An example of something unexpected in this extract is when during the interview someone on the front row coughs. Norton picks up on this and makes some jokes about it.